Civic engagement initiatives have received increasing attention at colleges and universities across the United States; some have even begun to make them a graduation requirement. Though each institution may have a specific definition of the term “civic engagement” that is adapted to their unique goals and objectives, in general, civic engagement is the fostering of democratic ideals, civic mindedness, and political action through education, awareness, and reflection. Art history courses offer a variety of opportunities that can introduce students to important aspects of civic engagement. On a fundamental level, because they cover many different cultural contexts and artistic traditions, art history courses expose students to a type of cultural literacy, making this discipline fertile ground for investigations of broad civic issues. In order for students to understand a given society’s culture, they must understand the religious, economic, and political institutions that helped shaped it. Of course, upper level courses that focus on political art and activism or artworks that deal specifically with gender, sexual, or racial issues can provide many rich examples, but even a survey course can effectively integrate the themes of civic engagement within a wide range of cultural contexts. What follows here are some techniques for integrating civic engagement into a introductory-level art history survey course. Artists throughout time have made poignant social commentary on everything from workers’ rights to racism. At the beginning of class, you can lead a discussion on select works of art that center around issues of race, hierarchy, and power dynamics. Show some examples by contemporary artists Kara Walker and Kehinde Wiley, who both deal extensively with race and gender identity, or by Neoclassical artist Jacque-Louis David, whose paintings often have political themes. It is helpful to begin with these examples since their political and social motivations can be clearly outlined within their historical contexts. Ancient art, however, can be challenging to discuss within these parameters since we rarely know about the individual identities, biographies, and political leanings of the artists or their patrons. Therefore, when discussing art of the ancient world, one must take a broader, more contextual approach in order to illustrate the various ways art can take on civic issues. One option is to focus on current issues of cultural property, repatriation, and the destruction of ancient art during war. Some of the more popular case studies include the debate over the possession of the so-called Elgin Marbles, the 2003 looting of the Iraq National Museum (specifically the case of the Warka Head, which is typically featured in a section of chapter two in Stokstad’s textbook), or the very recent destruction of the ancient cities by ISIS, which is widely covered in the current news. A possible exercise is to turn the issue of the Elgin Marbles into a classroom debate or have students investigate the issues on their own by comparing the British Museum’s explanation of their current status http://www.britishmuseum.org/about_us/news_and_press/statements/parthenon_sculptures.aspx to that of the Greek Ministry of Culture http://odysseus.culture.gr/a/1/12/ea121.html or any number of articles on the subject, such as that from December 2014 in The Telegraph http://www.telegraph.co.uk/news/uknews/11274713/Why-are-the-Elgin-marbles-so-controversial-and-everything-else-you-need-to-know.html. Or, alternatively give students a research question, such as “What is the current state of the artwork from the ancient site of Palmyra and what should be done here?” Then, have students find and bring their sources to class for discussion. Another method could be to demonstrate how art has been used as a political tool to control, such as the visual propaganda implemented by Nazi Germany and its select promotion of art to represent its ideology, condemning most modern art as degenerate. Yet another fruitful endeavor is to ask students to critique the canon and the historiography of art history. For instance, many students are shocked to learn about the early-twentieth-century ethnographic theory of Leo Frobenius, which argued that the lost city of Atlantis was originally located off the coast of Africa. According to Frobenius, Greek descendants from this island introduced civilization, which inspired the high level of skill found in African art and culture. Popular culture can also offer opportunities for critique, particularly in Hollywood where white celebrities play characters of different ethnic backgrounds. (For more on the “whitewashing” of Ridley Scott’s recent movie Exodus and references to other famous examples, see http://www.cnn.com/2014/12/10/showbiz/exodus-whitewash-bible/. The approaches listed above are based primarily on incorporating aspects of current events into class discussion. What follows here will offer a new method for integrating civic engagement issues into a survey course: contextualizing ancient artworks within their respective political structures (such as monarchies, democracies, and republics) or in other aspects of civic institutions (such as distribution of resources, law making, social hierarchy, and taxation) with the intention that these investigations can act as springboards to consider modern equivalents. By discussing how these artworks connect to various social issues, students can come to understand the historical connections and implications of present day civic institutions and consider their current situations within a wider context of human history. One of the constant struggles of the art history professor is the issue of coverage. This lecture’s structure takes this issue into consideration by framing the content below as a midterm review class session of canonical art from ancient to classical periods. 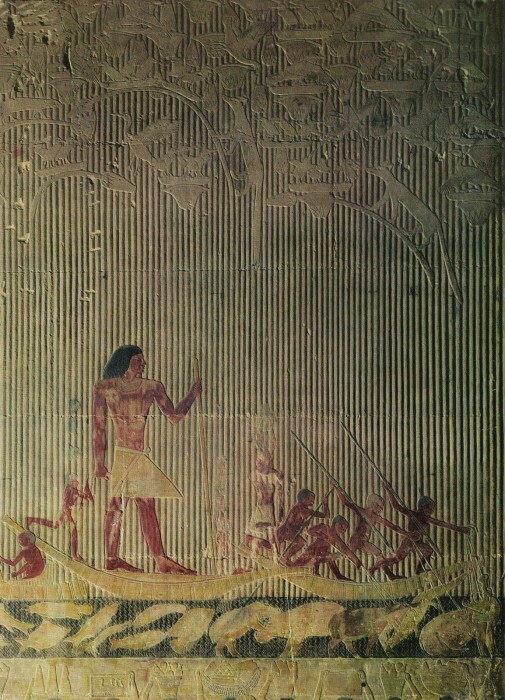 Ti Watching a Hippopotamus Hunt, Old Kingdom, Egypt, c. 2450–2359 BCE. Finley, M.I. Politics in the Ancient World. Cambridge: Cambridge University Press, 1983. Haywood, John. The Penguin Historical Atlas of Ancient Civilizations. London: Penguin, 2005. Pollitt, J.J. Art and Experience in Classical Greece. Cambridge: Cambridge University Press, 1999. Cuno, James, ed. Whose Culture? The Promise of Museums and the Debate Over Antiquities. Princeton: Princeton University Press, 2012. Miles, Margaret, M. Art as Plunder: The Ancient Origins of Debate about Cultural Property. Cambridge: Cambridge University Press, 2010. The ideas presented here have grown out of two grants obtained by Kingsborough Community College: Student Learning for Civic Capacity: Stimulating Moral, Ethical, and Civic Engagement for Learning that Lasts funded by The Teagle Foundation and Bridging Cultures to Form a Nation: Difference, Community, and Democratic Thinking funded by the National Endowment for the Humanities. Other institutions that offer support for similar themes include The Association of American Colleges and Universities (AAC&U), The American Democracy Project (an initiative started by the American Association of State Colleges and Universities), The Democracy Commitment, Project Pericles, and The Center for Information and Research on Civic Learning and Engagement. civic engagement – in general, civic engagement is the fostering of democratic ideals, civic mindedness, and political action through education, awareness, and reflection. However, each institution or foundation may have their own working definition with subtle differences. My institution’s more detailed definition is as follows: Kingsborough Community College, CUNY accepts as a fundamental principle that education requires social awareness, an acceptance of social responsibility, and active participation in meeting the challenges of a modern society. Through civic engagement, we recognize our mutual responsibility to care for each other in the college, in our communities, and on our planet. This responsibility may be accomplished through political activity, community service, engagement in leadership roles, advocacy or becoming informed about issues that relate to social change. Therefore, civic engagement at Kingsborough seeks to foster civic awareness while providing the skills needed for our students to actively participate in their communities. theocracy – government by divine guidance or by officials who are regarded as divinely guided. In many theocracies, government leaders are members of the clergy, and the state’s legal system is based on religious law. monarchy – a political system based upon the undivided sovereignty or rule of a single person. The term applies to states in which supreme authority is vested in the monarch, an individual ruler who functions as the head of state and who achieves his position through heredity. Succession usually passes from father to son or follows other arrangements within the family or the monarchical dynasty. democracy – government by the people; majority rule; in terms of ancient Athens–a system of government where the male citizens had political equality and could raise issues and vote. Republican Party – one of the two main US political parties (the other being the Democratic Party), favoring a conservative stance, limited central government, and a strong national defense. Democratic Party – one of the two main US political parties (the other being the Republican Party), which follows a liberal program, tending to promote a strong central government and expansive social programs. liberal – favoring maximum individual liberty in political and social reform in a political context. republic – form of government in which a state is ruled by representatives of the citizen body. Modern republics are founded on the idea that sovereignty rests with the people, though who is included and excluded from the category of the people has varied across history. Because citizens do not govern the state themselves but through representatives, republics may be distinguished from direct democracy, though modern representative democracies are by and large republics. oligarchy – government by the few, especially despotic power exercised by a small and privileged group for corrupt or selfish purposes. The White House, first phase of construction 1792-1800, with later modifications, Washington, D.C.
To prepare students to connect ancient cultures to their own experiences, it may be helpful to have them take the online survey conducted by the United Nations called MY World at http://vote.myworld2015.org/ before coming to class. This online platform asks people to vote on the six issues most important to them, with options such as “an honest and responsive government,” “equality between men and women,” “freedom from discrimination and persecution,” and “access to clean water and sanitation.” (Note: The online version of the ballot is available until sometime in 2015. If it is unavailable when you attempt to use it, you can convert to a paper ballot with the same categories or use the slide in the attached Powerpoint. For more on this project, see http://www.myworld2015.org/?page=about-my-world. After they reflect on their concerns, the class can then compare their responses to people around the world using the analytics page: http://data.myworld2015.org/. Laying this foundation may help students relate to the struggles and concerns of people around the world and throughout history. As of June 2015, the category that has received the most votes is a good education and the fourth highest category is an honest and responsive government. When one filters the data to specifically reflect answers from the United States, education remains the top priority with an honest and responsive government moving into second place. Ask your class to reflect on this and touch on the fact that many view education as a privilege that can lead to a greater understanding of government, which can ultimately lead to involvement. If you have a particularly confrontational group that has a hard time debating different ideas, perhaps consider having students do informal in-class written responses. Some students might note that the ancient Egyptians did not have the notion of public money nor consult the general populous of governmental affairs. The monarchy was largely concerned with glorifying the pharaoh and preserving his or her status and power in both life and death. Perhaps other students will be able to connect the fact that stable political power in ancient Egypt is intimately connected to its strict and long-standing artistic conventions, such as the canon of proportion. Egypt’s emphasis on durability or stability is also reflected in the choice of materials, often carving ka sculptures from very hard, durable stone like diorite. Others still might recall the prominent role played by religion and note how Horus, symbolized by the falcon, wraps its wings around the head of the pharaoh in Khafre’s ka sculpture, reflecting the theocratic aspects of political power in Egypt. With so much extant Egyptian art reflecting the concerns of the elite class, it may be difficult to address issues of inequity or that of non-elite individuals. One way to approach this is to point out how the image of Ti Watching a Hippopotamus Hunt uses hieratic scale, showing Ti as much larger than the hunters in front of him, indicative of his importance. His social standing is also suggested by his posture, which reflects the important artistic convention of memory image (or composite image) wherein the head is shown in profile, the torso frontally, and the feet in profile. This pose contrasts sharply with the variety and activity seen in the body positions of the hunters. Another way to contrast the social status of Ti with that of the hunters is to consider the setting of the artwork. This was found in Ti’s tomb, a place decorated and embellished in extensive preparation for his journey to the afterlife. A lavishly furnished tomb and mummification were reserved for the very rich and powerful. In fact, hierarchy was a pervasive concept in mummification. Herodotus describes three different mummification packages, ranging from the “best and most expensive” to the next best which is “somewhat inferior and cheaper” to the “cheapest of all,” a hierarchy that shaped both Egyptian art and Egyptian society. This discussion can serve as a window onto the long history of social inequity and how art reflects such issues. It can provide historical distance and perspective on issues that are in the current news, giving students a way to access difficult themes such as income disparity. The portraits of Akhenaten and his wife Nefertiti can represent what happened when such a system was disrupted. Akhenaten’s artistic production dramatically differs from earlier conventions and in turn illustrates and reflects the profound social and political changes he made. He abandoned the use of canon of proportion, which was the standardized recipe for depicting important individuals, especially pharaohs. It dictated strict measurements and placement of body parts, resulting in the nearly identical appearance of previous leaders. Instead, Akhenaten’s face is elongated, his lips are more accentuated, and his eyes are slightly slanted, giving him a unique sense of individuality. His body is depicted in a very androgynous manner, with a small waist and round hips as opposed to the triangular torsos of previous pharaohs. Some have interpreted this blend of male and female forms as a reference to Akhenaten’s dramatically new stance on religion. In the portrait of his wife, Nefertiti, one finds an unprecedented level of naturalism and sensitivity to detail. The pharaoh and his wife are no longer depicted as abstract, unchanging symbols of power. Rather, they are shown as individual people. His societal changes went beyond portraiture and art. He dismantled traditional polytheistic religious practices and instituted monotheism, worshiping the one god, Aten. He also moved the capital from Thebes to Akhenaten (present day Tell el-Amarna). In previous dynasties, the stability of the artistic conventions reflected the long-standing political stability. When the socio-political climate changed, so did the art. Creation of Law in Ancient Mesopotamia – After discussing the political system of ancient Egypt, it is useful to consider other ancient legal systems, which were created, again, with the heavy influence of religious belief. The Stele of Hammurabi documents one of the world’s earliest legal codes topped by a relief sculpture showing the code’s divine origins. As my students have usually already heard of Hammurabi’s code–or at least his most famous law that dictates an eye for an eye—I begin our discussion of this object by having them use their visual analysis skills to formulate a theory as to which figure is Hammurabi. Inevitably, they are able to identify the importance of the throne and headdress of the figure on the right, who is also larger and making large gestures. However, this often leads them to the conclusion that this figure must be Hammurabi. It is only after I point out that this is in fact the god Shamash that they realize their mistaken assumption that the king is the most powerful entity in this culture. We then discuss the divine origins of the law and the persuasive nature of such origins. Frequently, the conversation turns to the influence of religion on other legal codes–most commonly the Judeo-Christian and Islamic ones—and the role of such codes on the legal code of the United States and other modern nations. Finally, I note that there are depictions of “Hammurabi” (ca. 1950) in the Chamber of the US House of Representatives and a second depiction of him in the Supreme Court. In the chamber, the portrait of Hammurabi resembles the image of Shamash in the Babylonian stele rather than the king Hammurabi, suggesting that the artist or patron of this work may have made a similar mistake in their identification. A comparison with earlier art can lead to a conversation about the correlations between the milieu of the Greek golden age, the notion of democracy, and humanistic art. The government of ancient Athens was not a conduit for the will of the gods; rather, it was a place where human beings could affect change and strive for certain ideals. Therefore, the public needed to be informed, consider other opinions, and observe the world around them in order to make the best decisions possible. The government was not a separate entity from the people; the two were one in the same and decisions were made by voting, a revolutionary concept. However, it should be noted that only land-owning male citizens could vote, and not women or slaves. To clarify this point, you can show or assign your students the abovementioned video link from Smarthistory on “The Athenian Agora and the Experiment in Democracy.” This video can open up discussion on modern day groups who are marginalized in the voting process, such as those affected by current voter ID laws. If you have extra time, it may be helpful to review the basic definitions of a democracy and a republic and differentiate these terms from the more popular related terms associated with the Republican and Democratic parties. Further clarify these definitions by presenting students with the official definitions of terms such as “liberal” or “conservative” as noted above in the glossary. Upheaval in Ancient Rome: From King to Republic to Emperor –Begin your review of Rome by having your students recall the cultural and artistic similarities between Greek and Roman art. Many students will probably remember the Roman appreciation for Greek art, a feature nicely illustrated by Augustus of Primaporta’s Greek-inspired contrapposto stance similar to that found in the Spear Bearer. However, it should be pointed out that before the time of Augustus, during the republican period, Rome was conquering Greek lands, looting their art, and bringing it back to Rome. Thus, these prized works were originally symbols of political and military victory. An overview of Rome’s political history is a nice opportunity to discuss different types of political systems and how and why they changed. Like many other ancient societies, Rome began as a monarchy around 753 BCE, but transitioned to a republic in 509 BCE when the last of the Etruscan kings was overthrown. Though the historical records are sparse for this period, it is thought that this transition occurred because of the king’s tyrannical policies. To prevent further abuse of power by one individual, the republican system installed two co-leaders, consuls, to replace the king. Each consul had veto power over the other. The Senate, a body of citizens from wealthy, established families from the patrician class, advised and influenced the consuls, as did the popular assemblies, though to a much lesser degree. Thus, unlike Greek democracy but similar to the current US system, the Roman republic was a representative form of government based on an important series of checks and balances. Romans voted for their consuls, magistrates, judges, and other official positions. Furthermore, in Republican Rome one could become a citizen of Rome. Citizenship was open to foreign people and conquered people, one did not have to be born in the city itself. This could lead to a debate on contemporary issues of immigration and programs such as The Dream Act (Deferred Action for Childhood Arrivals (DACA), which may be available to your students or their family members. 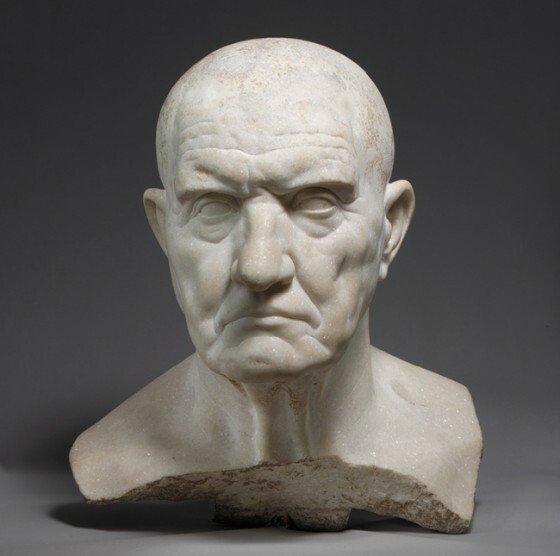 The veristic portraiture popular during the Roman Republic, characterized by the Metropolitan Museum’s Marble Bust of a Man, seems to embody the values of such a system. For instance, the textural details of the irregular, carefully observed wrinkles—and the wisdom they represent—act almost like badges of honor, representing this person’s social and political prestige. The bust format also reflects the importance of one’s individuality, focusing attention on this particular person’s likeness rather than the overall condition of their body (as the Greeks would have). Ask your students to reflect on the importance of individual characteristics today. Does one need to come from an established family in order to participate in local politics? National politics? What role does money play in the current political landscape? Although students might not have the answers immediately, by asking these questions they are becoming more aware of these issues. The format of the portrait bust likely emerged from the practice of death masks of deceased ancestors. This link is important to understand another key aspect of the Roman political arena: one’s family name and social standing were vitally influential. An important theme throughout the republican period is the class conflict between the patricians, the elite landowning class, and the plebeians, or working class (for more on this, see PBS’s basic, but informative websites: http://www.pbs.org/empires/romans/empire/patricians.html and http://www.pbs.org/empires/romans/empire/plebians.html). At times, the patrician will was so dominant that it might be more accurate to describe the system as an oligarchy. The struggle for resources and power between the upper and lower classes contributed greatly to the civil war that brought the republic to an end and gave rise to the birth of the imperial system. Augustus used art as propaganda to supplement and increase his rise to political power. Augustus of Primaporta is a sophisticated visual manifesto of this leader’s various attributes, from his eloquence as an orator, signaled through his hand gesture, to his divine ancestry, suggested by the cupid at his feet. His subtle blend of individualized portraiture (ears that stick out, identifiable curl in his hairline) and idealism (youthful body) simultaneously speak to the republican traditions and signal something new, namely, a Roman golden age–the Pax Romana. A profound change took place here, in which the Roman people embraced autocratic rule after many centuries of a representative government. Ask your students to consider if something like that could ever happen today and, if so, under what circumstances. If you have time, consider the public works and programs available to the Roman people during the Pax Romana. In exchange for their taxes, Romans enjoyed extensive road building and water projects such as aqueducts and sewage systems. This can lead students to consider the types of programs available today, programs they think are needed but do not yet exist, and possible funding sources. Portrait Bust of a Man, Republican Rome, 1st century BCE. What type of government does the US have and how did you learn this? Can you identify a country with a different political system from that of the US? Where would you go to further investigate this issue? Why do you think this is a good source to consult? Which political party do you support? How did you come to this decision? Where would you go to learn more about both parties’ positions? Why do you think this is a good source to consult? What is your position on how political campaigns are financed and how did you come to this position? Where would you go to learn more? Why is this a credible source? What should the government’s role be in providing access to natural resources such as fresh water? How did you reach this position? Where would you go to learn more? Why is this a credible source? What should the government’s role be in the redistribution of wealth to pay for social programs such as education and healthcare? How did you reach this position? Where would you go to learn more? Why is this a credible source? Do you think there should be a separation of church and state? Why or why not? How did you reach this position? Where would you go to learn more? Why is this a credible source? What is the US’s current policy on immigration? Where did you obtain this information? Why is this a credible source? What is your stance on this? Where could you go to learn more? Another way to get to students to reflect on this material is to ask them to consider other local civic issues that impact their daily lives. You can use the UN survey’s list or ask them to be more specific, and then ask them to see if such issues impacted earlier societies. Likely the issues raised will somehow relate to inequality, a theme abundant throughout the survey course. One example might be to consider the issues related to access in education (i.e., student loans, tuition costs, distribution of scholarship, etc.). The category receiving the highest number of votes was “a good education.” Ask students why this is so highly valued and have them reflect on how many societies in the past—and even today—did not have the opportunity to study. This could lead to a discussion about how an education can improve one’s position. Option #3: Does an understanding of history help? Ask students to reflect on how a study of history can inform the present. For instance, “Using today’s class as a starting point, please consider if history can help us understand today. If so, explain how. If not, explain why not.” One example might be to reflect on gender inequality. You could show images of women from ancient Egypt, such as the Kneeling Figure of Hatshepsut and Menkaure and a Queen, Probably his Principal Wife, Khamerernebty II and consider the position of women in the ancient world versus today. Students might recognize that typically women obtained positions of power through their male family members in the ancient world while now many women obtain positions of power through merit. This conclusion can then be further complicated by bringing in a discussion of the persistence of the gender gap in terms of pay.